Have you ever had that feeling? You know, that “something.” That “something” that starts nagging at you and just won’t stop. I’m pretty certain you have, even if you’ve never acted on it. That “something” is your passion! To be honest, recently, well, ok, since forever, I have been looking for “something”…”Like writing a blog, you might ask? Why on earth would anyone want to write a blog?” No, not by a long shot. I didn’t even know what a blog was until about six months ago when I started following a few cool craft blogs on Pinterest. “What is it that keeps nagging at me? For you to understand better, allow me share some background information. (Make yourself a note to think about your own background when trying to appease that little nag). Ok, I have been enjoyed crafting for most of my life, as a hobby, not a career. That is what I enjoyed doing, besides work and taking care of my family. Selling at little craft shops, festivals, consignment stores, home shows and Etsy. You name it, made “that” and tried to sell it, “there.” Lol. Still have rooms full of craft supplies to prove it. (Coming soon, post about craft room clean out, hopefully). It was fun, most of the time, but I was too slow and too particular to produce enough pieces to even pay the rental fees most of the time. I started getting frustrated and stressed out instead of enjoying the process of creating. So, I decided to give up crafting, except for making some items for my own home and maybe a few gifts for my friends. No more pressure to create and sell. Fast forward six months… “How many craft projects do I need in my house and my children’s homes and how many handmade gifts can I respectfully, give away to friends?” The answer was easy, not many more! If this “minimal crafting and not selling” was cluttering up my house and this “something” was still nagging at me, I had to figure out what I was being called to do now. After I started reading the craft blogs, I started researching and the more I researched, the more it seemed like blogging might be a good fit for me. I’ve always liked to write. I can use my creativity by writing and designing (which, I have started to realize, for a blog, is much harder than it looks), I can learn something new, which is exciting, and possibly, one day, generate a small income for my work. But, the main reason I chose to start a blog is that I truly enjoy helping people and see this as an opportunity to do just that. Now, I’m not talking about big help, like a doctor or accountant, but it doesn’t have to be rocket science to be helpful to others. I’m talking about little bits of help, here, there and anywhere I can, but nonetheless, help. “something” is calling your name. It might not be the first thing you try, or the second, but every step is progressing you towards your “something.” Your “something” should be your passion, but it does not have to be the thing that makes you a living. You can have a job and a passion! How about that? • Read magazines that you enjoy. You may be drawn to an article that peaks your interest. Can’t I just buy the sample? • Think about things you used to enjoy doing. What were your interests pre-motherhood or pre-marriage, pre-adulthood? • At work, focus on figuring out parts of the job you enjoy & parts you dislike. No, I won’t force you to blog, or even write, unless you want me too, but I will show you how to do some quick craft projects, neat ways to organize your photos, and make easy party decorations using your Cricut. If you don’t have a Cricut, maybe you’ll get inspired to buy one. I will share stories, freebies, feelings, travels…anything I think may be of interest to you, my readers, my friends, because my greatest hope is that a post will peak your interest and inspire you to listen to that little voice, explore new interests and find that “something” that has been nagging, tugging, lurking, in the back of your heart and mind for so long. 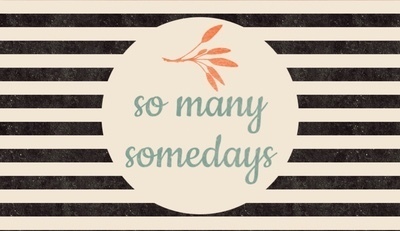 We only have “So Many Somedays”. Let’s not waste another single one! Find your “something” and you will find your passion! P.S. I would love to hear your comments. Have you found your “something”? What is it? Are you feeling that little tug? Are you still exploring your interests? Keep me posted!